A video provides background on the Allen Institute for Brain Science and looks ahead to the new project. Software billionaire Paul Allen is pledging $300 million to establish a series of "brain observatories" at the Seattle research facility named after him, with the aim of mapping and manipulating the mouse brain. The project's leaders say the insights gained could be applied as well to higher forms of life, including humans. "We believe that this project has the potential to revolutionize our understanding of the mammalian brain," Christoph Koch, chief scientific officer for the Allen Institute for Brain Science, and Harvard neuroscientist R. Clay Reid said in the journal Nature. Details about the brain observatory project were laid out today at the Allen Institute in Seattle. In an advance interview, Koch cast the effort in terms usually reserved for the multibillion-dollar Hubble Space Telescope project or the $10 billion Large Hadron Collider. "We're focusing a huge amount of resources on trying to understand this piece of highly, highly complex math and science. The most organized piece of matter in the known universe is the cerebral cortex, the one that makes you and me think and smell and hear and talk. That's what we're trying to understand," Koch told me. "Just as people spend a huge amount of time and effort to build these different observatories to look at the origin of space and time, we're going to build these observatories, these very sophisticated instruments, all of them using common standards, all peering at the brain — primarily animal brains, but also the human brain." In a way, seeking out the secrets of the brain is harder than looking for the Higgs boson, because neuroscientists have not yet developed a model for brain function as robust as, say, the Standard Model of particle physics. "In that sense, neuroscience may never have the maturity of physics, partly because the system we're dealing with is enormously more complex," Koch said. 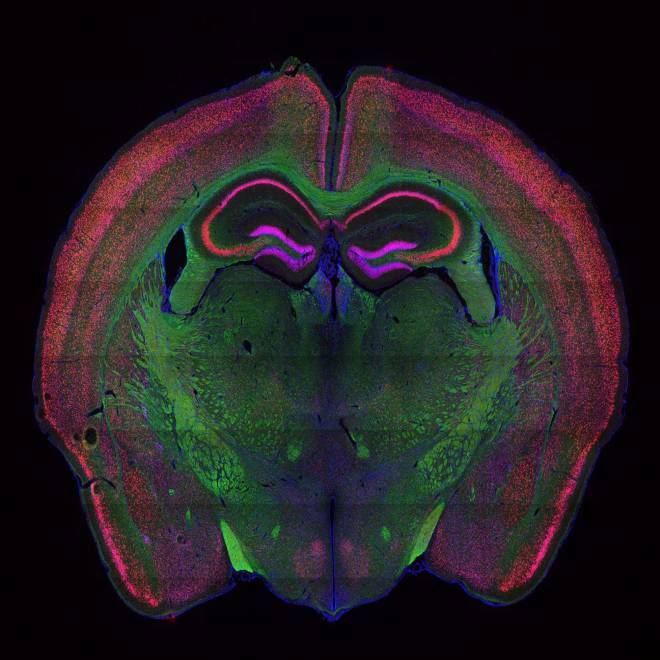 This image highlights a coronal section of an entire mouse brain, which was stained to mark anatomical boundaries in many brain regions. This process reveals areas where the density of cell bodies is higher (stained in red) compared to the density of axonal projections, or connections between neurons (stained in green). Such anatomical maps will be among the products emerging from the "brain observatories" created by the Allen Institute for Brain Science. The brain observatory project plans to start with the visual cerebral cortex of the mouse brain, because that's an area that neuroscientists understand relatively well, Koch said. Researchers from outside institutions could work with the Allen Institute's staff, using sophisticated instruments to light up the electrical circuitry of individual neurons, trace the connections between neurons, and watch how thousands of brain cells respond to specific stimuli. All these techniques would be stitched together to produce a full physiological and structural characterization of entire brain regions. Such insights should lead to better computer models for brain function, which can be fed back into the experimental side of the project for validation. Having the firepower for computer modeling right next door to the experimental labs should produce "a virtuous circle that will be iterated until the model faithfully reproduces the data," Koch and Reid wrote. An estimated 60,000 neuroscientists are studying the brain at 10,000 labs worldwide, but the brain-observatory approach should be "very complementary" to those widely distributed efforts, said Allan Jones, the Allen Institute's chief executive officer. The institute's findings, including genetic atlases of the mouse brain and the human brain, are traditionally shared openly with other researchers, even before journal publication. Koch compared the mouse brain to a set of 100 billion Lego toy blocks, organized into 1,000 different kinds of blocks. "First we need to understand how many different parts are out there, and then how they fit together," he said. The insights gained from the visual cortex could be applied to further exploration of other functional areas of the mouse brain, and then to other mammalian brains — including our own brains. When it comes to cortical structure, "there isn't anything particularly unique about us," Koch said. "The principles are all going to be the same. ... If we understand them in a simpler system, then we are a long way toward understanding us." Another aspect of the project is the development of lab-grown human brain cells that reflect the genetic components associated with neurological conditions ranging from autism to Alzheimer's. Stanford neuroscientist Ricardo Dolmetsch, a specialist in that technique, will be joining the Allen Institute later this year, as will Harvard's Reid. Microsoft co-founder Paul Allen discusses how the donation to his Allen Institute For Brain Science could help spur new understanding and treatments for diseases of the brain. KING's Jean Enersen reports. During today's briefing in Seattle, Allen said his interest in brain research stems from his work in computer software, as a founder of Microsoft Corp. and other ventures. (Microsoft is one of the partners in the msnbc.com joint venture.) He noted that the most advanced software doesn't come close to matching the complexity of the human brain. "There is really no greater challenge, with potentially huge impact, than understanding how brains work," he said. Allen said he was also motivated by the fact that his mother suffers from Alzheimer's disease. But he emphasized that the institute would focus on basic research rather than disease treatment. "Our dream is to one day uncover the essence of what makes us human — to explore and understand how the brain makes us remember, forget, interact with each other and become the people we are," Allen said. Allen's $300 million pledge will be spread out over four years to jump-start the Seattle institute's initial 10-year plan for the observatories. The software executive, whose net worth was recently estimated at $13.2 billion, founded the institute in 2003 with a $100 million contribution, and has donated an additional $100 million since then. "My commitment today doesn't just continue the work of the institute," Allen said. "It greatly expands the scale and the scope of our mission." The Allen Institute says it will use some of the money to double its staff to more than 350 employees over the next four years, as well as to develop new suites of instruments and new computer-modeling capabilities. Leroy Hood, president and co-founder of the Seattle-based Institute for Systems Biology, said he was looking forward to collaborating with the Allen Institute's researchers on the brain observatory project. "I think it's a terrific project," Hood told me. "Their approach to 'big science' and openness is exactly what's needed to move the field forward." In addition to Allen's contributions to neuroscience, the billionaire has pursued a wide variety of interests beyond software, including ownership of the Portland Trail Blazers basketball team and the Seattle Seahawks football team, the establishment of the Allen Telescope Array, and financial backing for SpaceShipOne's prize-winning rocket venture and the Stratolaunch air-launch company. Back in 2008, I set up a scale of financial denominations for big scientific projects, ranging from 1 allen (the estimated cost of the SpaceShipOne project, $25 million to $30 million) to 1 apollo ($100 billion or more). On that scale, Allen's contribution to the brain observatory project equals roughly 10 allens, or three-quarters of a rover (the $400 million Opportunity rover, that is, not the $2.5 billion Curiosity rover). Still more money will be needed for the out-years of the project, perhaps including government funding. Is this project worth the price tag? How will it mesh with other potential neuroscience projects, such as the proposed billion-dollar European Human Brain Project? Feel free to weigh in with your comments below. Update for 6:30 p.m. ET: At today's Seattle news briefing, I asked Koch what the top technology on his wish list would be. "We'd like to listen to every single nerve cell," he replied. "Right now, we can't do that." He envisions some sort of wireless receiver system that would have so much resolution that it could monitor individual neural impulses inside your head. Sounds pretty science-fictional to me, but what do you think? Also, this week's issue of Nature includes a report on the $40 million Human Connectome Project, a five-year, $40 million initiative funded by the National Institutes of Health to map the brain's long-distance communication network. Some researchers wonder whether the project is really ready for prime time. "I would do the basic neuroscience before I started running lots of people through MRI scanners," David Kleinfeld, a researcher in physics and neurobiology at the University of California at San Diego, is quoted as saying. Is this the decade of big-science brain research? That's one more question to chew over in the comment section.